Good morning, I hope your Sunday is going well. Here’s Ruth Casie with information about her Druid story, and an excerpt for use to read over our morning beverage of choice. Coffee, where’s my coffffeeee. She was his witch, his wife and his warrior. He was her greatest love. Four centuries couldn’t keep them apart. I’d like to thank Mona for inviting me to her blog today. She’s asked me what inspired me to write my Druid Knight series. My interest was spurred by Who Do You Think You Are? a television program that helps celebrities trace their ancestry. I watched as a young actress walked the streets in an English town that hadn’t changed since her ancestors lived there four hundred years ago. That’s when I thought… what would her ancestor think of a 21st century woman? Women today are more outspoken, fearless and confident. What would happen if she had to live in the past with her 21st century mind set? All sorts of conflicts came to mind. I tackled those issues in the first story, KNIGHT OF RUNES. But that was only one side of the coin. How would a medieval knight cope in the 21st century? The advances in the last hundred years alone have been amazing. I saw a man from the 17th century responsible for managing an estate as arrogant and dictatorial. How would he react to the 21st century? What would he do when his legacy was in jeopardy? And what would happen when these people from two different eras fall in love. How much would they sacrifice for the other? 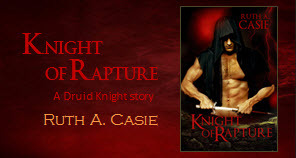 If you’d like a peek into how much they mean to each other, read on for an excerpt, Chapter One of KNIGHT OF RAPTURE. Visions of his warm bed and even warmer wife lit Lord Arik’s face. A deep rich chuckle rumbled in his chest at the vivid images of how he’d wake Rebeka. Who would have thought the great druid Grand Master was a besotted bridegroom? The summer had been warm and all the sweeter with Rebeka by his side. He stood on the open terrace at the back of the manor, surveyed his domain and swelled with pride. Fayne Manor was a thriving estate that had been the family home for eleven centuries and it would stand for eleven more. While he waited for the sun to rise, he prepared for the ritual. He took off his linen shirt and braced himself for the crisp September air. The morning breeze stirred sending the red and orange leaves racing across the garden, twisting and tumbling like rowdy children at play. Out of the corner of his eye he sensed a movement but nothing was there. It sobered him. The Shade, an otherworldly thing, was an old acquaintance begging for an audience. Like an old woman with aches and pains predicting bad weather, the Shade’s shadow warned him of trouble. What did it bring this time? He had learned long ago to listen to it. It was accurate, most of the time. He glanced at manor door. A little longer. He wanted more time to love her before he began her training. Dark Magick. Faith. She wouldn’t be the same when they were done. He didn’t want any changes. She was fine the way she was. He placed his shirt on the stone railing as the sky brightened. Any moment the small sliver of golden sun would crest the rim of hill then he would ask the Great Mother to grant his people a good day. His nostrils flared. The trace of a sweet pungent metallic smell sobered him. He tried to push it aside but it remained at the edge of his mind stealing the last of his pleasure. Lightning. The smile slid off his face. For everyone’s safety he needed to take action—he recognized the signature. He cleared his mind for the ritual and thoughts of Bran faded—for the moment. And, he murmured, for giving me Rebeka. The lingering mist faded with the morning sun. Like a cozy down blanket pulled from a bed, the retreating haze revealed the thriving village and farms. Soon the quiet valley would come to life. Farmers would set off on their daily chores, the villagers would open their shops, and his soldiers would take to the practice fields. His chest swelled. Was it a sin to be proud of what he, together his people, had accomplished? He’d do anything for them, anything to protect their hearths and homes. He closed his eyes for the morning blessing. “As above, so below. As within, so—.“ He took a deep breath and caught the faint scent of lavender and roses. The teasing fragrance announced Rebeka was near. Her morning appearance, with his tankard of watered ale, had become part of his ritual. “…so without,” he continued the rite. “May guidance and love mark our way. And bring success for our clan today. So mote it be.” He opened his eyes. “The day appears promising.” Rebeka’s voice brought a smile to his lips. She tugged her shawl closer around her shoulders. “M’lord.” Soft puffs of breath surrounded her mouth. There was indeed a chill in the morning air. She gave him his discarded shirt and waited while he shrugged into it before handing him his ale. She had little on beneath her great shawl. It made his mind wander. “Yes. It will be a good day.” It was always a good day when it began with her at his side. “Almost as good as last night.” They drove each other mad with their verbal banter and soft touches yesterday until she surrendered to him. His reward was to tease her until she yielded last night. Who knew who would yield today? Either way they both won. Her gaze slid from his chest to his face. Her searing expression brought back the warmth of their passionate evening. Her flushed skin was her silent response. He returned his gaze to the valley pretending to be interested in the smoke now rising from a distant chimney. He turned his attention back to her. Faith, how he loved sparring with her. Out of the corner of his eye he caught her blank stare. But the challenge was given and he understood it had been accepted. With a long pull on his ale he returned his attention to the curling smudge in the sky and like a game of chess waited for her to make the next move. He didn’t try to hide his arousal. He set the tankard on the wide stone railing before the ale sloshed over its rim. “Happy thoughts for the day, husband.” She laid her hand on his chest and bent to kiss his cheek. He caught her around her waist and brought her face to his. How he adored the passion in her violet eyes. They asked for more. He answered with a searing kiss and teased her mouth open with his tongue. She didn’t protest. Instead she moved closer molding her body into his, fitting like a key in a lock. Encouraged, his tongue swept her mouth and he reveled at the sweet taste. When he released her she stood in the crook of his arm, her head on his chest with his cheek resting on her hair. Quiet and content, he savored the last few moments while the sun rose over the edge of the hill. “Wife, you surprise me with the… thoughts you put in my mind.” His blood heated at the mere idea of his musings. “Yes, I know… But if you did mind touch and put thoughts in my head I know what they would be.” Mind touching was a special skill. No Druid would trespass another’s mind. It was a grave violation. She would never abuse her ability. The sound of footsteps from the Great Hall interrupted them. “Arik? Ah, here you are.” Logan, his younger brother peeked out the terrace door. “Are you ready to leave? The sun rose hours ago. I thought we’d breakfast with the men and start maneuvers today.” Logan gave Rebeka a devilish nod. He casually filched Arik’s forgotten tankard and took a deep swallow. Arik observed the bottom of the sun clear the eastern hill. “Hours?” He shook his head and let out a snort. Threading his fingers through Rebeka’s he gave them a tender squeeze. He had wanted more time with her. He always wanted more time with her. But for now their game was over, at least until tonight. “Hours,” Arik muttered while he released her then took the tankard out of Logan’s hand. “And get your own ale. Better yet, get yourself a wife to bring it to you,” he told Logan in feigned aggravation before he drained the tankard dry. “Ah, but where will I find one like Rebeka?” Another nod for his sister-in-law. Rebeka bobbed a quick curtsey and tried not to laugh. Find one like Rebeka, indeed. There was no one like her, but good sense told him Logan would find a love of his own. He earned that. A cool morning breeze stirred the bottom of Rebeka’s thin night dress and she shivered. “Go get something warmer on before you catch your death,” Arik whispered in her ear. She nodded and scooted into the house. “She came through the portal to return to you. She’s strong. We need her skills to defeat Bran. We can’t do it without her.” Logan didn’t hide his impatience. “Yet you haven’t taught her about Dark Magick. Instead you hide it from her. And I know why.” Arik almost sneered at Logan. This was an old argument. Logan would have had him start her training after their wedding night. “You’re afraid she won’t be able to control it, that she’ll become like Bran. Don’t you see she’s made of stronger stuff?” Arik waved him off. He stepped away to put space between them. But space wouldn’t help. Who did he fool, certainly not Logan. Arik glanced at his brother and recognized his silent strength. The only fool here was him. He couldn’t continue with this idyllic illusion. Logan was right. He had been delaying teaching her. He knew Dark Magick would test her, change her. And he wanted her just the way she was. “I put out the word. Many of the men arrived last night. I’ve told them to meet us at the garrison this morning.” It was Logan’s turn to find the smoke from the distant chimney interesting. Ah, this was the crux of the matter. Maximillian’s last time travel portal still existed. Arik had sealed all of the others except this one in order to leave Rebeka one opportunity to go back to the 21st century. She valued her independence and ability to determine her own destiny. It challenged him but he loved her for it. He couldn’t seal it, trap her here. It had to be her choice. “We’ve spoken about closing the portal on Samhain,” Logan said. Magick was strongest on the first day of spring, with its balance of light and dark. He needed that magick to finish the former Grand Master’s work. “I agree with Logan. Seal the portal and begin my training.” Arik stood next to Rebeka she had no idea what she asked. He brought her around to face him and peered into her eyes. “I can’t undo the magick once it’s done. You must be sure.” Would she regret not returning? He needed her to be certain. “She’s right. Seal the portal before Bran finds a way to use it.” Logan echoed before he started took to the terrace steps on his way towards the manor gate. “Wait,” Arik called after him. “I’ll go to the garrison with you.” He trotted down the steps and caught up with Logan. “So, you recalled the men. You were certain I’d agree.” He had considered calling the men after Samhain. A few days earlier were fine with him. But he hadn’t wanted to start Rebeka’s training. He glanced back at her standing on the terrace. Logan was right. They needed his sorceress wife’s strength. Rebeka watched the brothers leave through the garden gate and marveled at their similarities. People moved out of their way to let them pass. Their self-confidence and air of authority was obvious to everyone. Arik gave the appearance of one who demanded instant obedience. Logan was quick to learn the skill. From the back they were difficult to tell apart. But she would recognize Arik anywhere. He moved with a smoothness and grace that excited her. She took the empty tankard then entered the Great Hall ready for breakfast. Maybe later, when she finished harvesting herbs, she’d take the trail from the meadow that passed by the practice field. She pursed her lips at the idea. It was more than watching her sweaty husband half undressed practicing with his men. No, she set a wicked smile on her face. It was all about watching her sweaty husband half undressed. “And how did you know the men would gather today? You shouldn’t eavesdrop.” Skylar’s scarlet blush flashed up her neck to her checks. Rebeka bit her lip to keep from smiling while she took her seat at the table. Skylar’s embarrassment told her she was right. Cheer on the men? Rebeka was more inclined to believe that Skylar meant to cheer on her Robert. And how different was that from her watching her Arik? Elfrida, the oldest person in the village, lived alone in large house on the path to the lake. She had been Skylar and Aubrey’s nurse, and even Rebeka’s nurse. Some said the woman was so ancient that she had been the nurse for the Ancients who lived in the Otherworld. Her nurse. She hadn’t remembered Elfrida when she returned. She hadn’t remembered anyone. When her father took her to the 21st century to protect her from Bran and his Dark Magick he clouded her memory with an enchantment. Skylar’s head rose. “It’s not that I don’t want to go with you.” The bread in Skylar’s fingers was poised in midair. The pleading expression on her face melted Rebeka. It was obvious to her that Skylar wanted to do both but who could compete with the handsome Robert. The boy searched for any opportunity to spend time at the manor house. Rebeka laughed. “Go ahead to the practice field but don’t stay too long. Jeannie and the other women will need help with the tables and food.” Skylar popped the last of the toast into her mouth then got to her feet. “How do I look?” She brushed imaginary crumbs and wrinkles from her skirt. “Don’t shine too much or you’ll blind Robert.” Rebeka shook her head then realized that being older and in love wasn’t much different. “I’ll be back in plenty of time.” Skylar rushed from the room. “We’re making sachets for the festival. I can tell her I’m coming later.” A frown settled on Aubrey’s face. “I do like helping her. She always tells old stories about the family.” Aubrey licked the jam from her fingers. “Skylar likes to listen to them too. She pretends she’s grown up but you should see her when Elfrida starts. Her face gets all dreamy.” She wiped her hands on her napkin. Aubrey’s face broke into a broad smile. Rebeka was glad to see the young girl happy and animated. It had been a few months ago that Cousin Katherine had bullied and harassed her. A distant cousin of Arik’s, Katherine arrived for a visit and stayed on after Arik’s sister Leticia death. Without a woman in the house, Katherine had taken on more and more household control until she ran Fayne Manor. Now Aubrey’s face was bright and she chatted almost as much as her sister, if that was possible. The change had been startling. She had been withdrawn and almost never spoke. Everyone in the manor and the village had been concerned. Katherine had found Aubrey’s vulnerable spot, Leticia. The more Aubrey tried to hold on to her mother’s memory, the more Katherine bullied her. Katherine, the witch. The very idea of the woman made her blood boil. Katherine had tried to keep Arik under her power and isolate him from everyone. It wasn’t all Katherine’s fault, it was Bran’s. It had taken little for him to manipulate the woman’s already jealous and spiteful mind—giving her the tools to plot against her family. When she realized Arik would never be a part of her twisted dream, to be the true mistress of Faye Manor, she used the tools Bran gave her for he own purposes. With murder in her heart she was determined to see her dreams fulfilled. Memories of what happened at the standing stones and portal filled her mind. She had been caught in the magick gateway. Arik had been intent to get her out. He didn’t see Katherine attacking him from behind. But she did. She threw her dirk and hit her mark. Arik got her out of the portal. But while Katherine lay wounded she taunted them. She admitted she had killed Leticia. The pain that had crossed Arik’s face had broken her heart. The woman had kept on laughing until Arik swung his sword and silenced her forever. Rebeka glanced at Aubrey finishing her meal. No regrets. She’d do it again to save those she loved. But when would Arik understood the man behind everything, Bran, was beyond saving? There was no way he could turn back. She understood the devastation that Bran suffered when his wife, Cay, died but that was a long over used excuse. He was aware of the consequences of using dark magick before he began. Everything had consequences and some couldn’t be avoided. Arik knew that better than most in his capacity as Grand Master and lord of Fayne Manor. “Rebeka, is something wrong?” Aubrey asked. “Nothing’s wrong. Reminiscing.” She pushed Bran out of her mind and concentrated on her breakfast. “I won’t.” Aubrey dusted the toast crumbs off her hands and rose. She leaned over to Rebeka. “I’ll meet you in the bakers as soon as I’m done.” She hurried off through the kitchen. Jeannie set the tray on the table and collected the dishes. “And you’d better hurry, too. I’ll need those herbs. I’m making the herb goat cheese you’re fond of.” Jeannie gave her a sideways glance. Rebeka licked her lips thinking about the creamy cheese. It was a recipe she’d made for Jeannie, one she learned in the 21st century. “Yes, ma’am,” she said as she too left the room. The day was bright and mild, a good day for a festival. Not a cloud in the sky. A breeze carried the hint of cooler days to come. After the hot summer, the day was a perfect relief. The aroma of fresh baked bread wafted up to the manor and drew Rebeka into the village. Happy and content, she leaned against a table in the market square, eating the last bite of the warm crusty bread slathered with sweet creamy butter. “You approve?” Mary’s voice grabbed her attention. “You told me you were eager to see everyone.” Rebeka had a special place in her heart for Mary. Rebeka glanced past Mary at the crowd milling around the table and the clutches of chattering neighbors who had been hard at work with the harvesting and preparing for winter. It reminded her of the 21st century coffee wagon. “Yes. This is where I belong and where I want to be.” All those early concerns about how she had arrived at the manor. The irony was laughable. The Lord Knight of Fayne Manor was the Druid Grand Master—the ultimate magician. And she’d worried his people wouldn’t be able to accept that she’d traveled through time. Yet when he’d tried to explain his magick she considered him to be primitive. How absurd and narrow-minded. “Mary.” One of the other women waved her over to another table. “I’ll be right there,” she called out. She turned back to Rebeka. “Wait until you see what we’ve planned. I know I shouldn’t say anything but it’s your first fall festival as lady of the manor and we have a surprise for you.” The woman was excited she couldn’t stand still, but hopped from one foot to the other. Rebeka paused, “You know you mean as much to me.” Mary was the first in the village to befriend her, an outsider. All her life she shied away from attachments with a sense of not belonging. But she didn’t retreat from Mary. “Mary.” The woman’s call grew more insistent. “Coming,” Mary shouted. She squeezed Rebeka’s hands. “Of course I do. And understand I am not the only one who recognizes the good and caring person you are. Everyone does.” One final squeeze and she hurried off. Rebeka stared after her. In the 21st century she and her father, an authority on Celtic history, lived near a rural college campus. It was only the two of them. She surmised that her parents must have been very much in love. He never spoke about her mother nor did he have any pictures of her. She asked questions but got short unsatisfying answers. Over time, she stopped asking. They stayed to themselves most of the time. He died when she was a freshman in college and believed she had no family and belonged nowhere until she discovered her place and her people. She only had to travel back in time four centuries to find them. “They need more bread.” Marcus, Arik’s captain stood next to her. “Skylar and the older girls set a table by the practice field to serve the men. She mentioned the villagers were gathering here. I came to see. Was this,” he motioned to the people in the square, “your idea?” He nodded his thanks to the young boy who handed him a tankard. “No, the morning gathering was Mary’s idea.” Her eyes moved from one group of people to the next. The villagers greeted the arriving tenants and their families with shouts and laughter. The small children ran about while the older ones chatted, the boys on one side and the girls on the other. More bread came out of the ovens and barrels of ale from the brewer. Marcus’ gaze spanned the crowd. His satisfaction and approval was apparent from the broad grin on his face. “Most of the men have arrived. The practice field is filled to capacity.” He brought his tankard to his lips but before he took a sip he gave her a teasing smile. “Lord Arik will be wrestling later. You may want to watch.” He drained his tankard. How did Marcus know she enjoyed watching Arik? She reflected for a moment. “Row, row, row your boat.” She had taught Arik, Logan and the girls to sing the song in a round one evening after dinner. They taught the song to the villagers at the summer bonfire. She saw a different side of him at the festive. Not the warrior but the man. That was when she realized she loved him. “I’m certain if you ask him he won’t say no.” Marcus titled his head in salute then followed his men. She observed him exchange his empty tankard for a piece of bread when he passed the last table. She glanced around and absorbed the warmth and closeness of family and friends and her love for Arik. How could he think she would ever want to leave? She slipped on her empty backpack and took her staff. If she hurried, she could harvest the herbs then watch Arik on the field. That would still leave her time to meet Aubrey by the baker. I hope you enjoyed reading about Lord Arik and Rebeka. ! I love to hear from readers too, so drop me a line at Ruth@RuthACasie.com OR visit me on Facebook: http://www.facebook.com/RuthACasie. I’m also on Twitter: @RuthACasie. If you’d like to receive my occasional newsletter, please sign up at http://www.RuthACasie.com. You can certainly see that Lord Arik and his Rebeka are very much in love. But what will happen when she’s tricked into the portal? If you’d like to read what happens, KNIGHT OF RAPTURE is available in ebook and paperback at Amazon and electronic formats from Barnes&Noble, Kobo, and iBooks. Ruth A. Casie writes contemporary and historical fantasy romance for Carina Press, Harlequin and Timeless Scribes Publishing. Formerly from Brooklyn, New York, she lives in New Jersey with her very supportive husband Paul. When not writing you can find Ruth reading, cooking, doing Sudoku, or counted cross stitch. Ruth and Paul have three grown children and two grandchildren. They all thrive on spending time together. It’s certainly a lively dinner table and they wouldn’t change it for the world. For more information about Ruth’s books, please visit http://www.RuthACasie.com.